What Day Of The Week Was August 23, 2011? 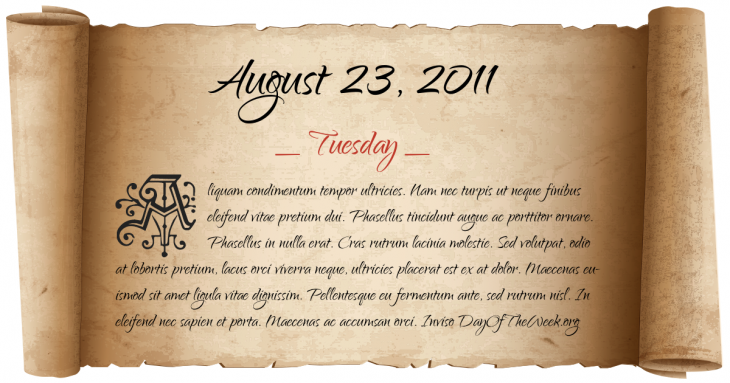 August 23, 2011 was the 235th day of the year 2011 in the Gregorian calendar. There were 130 days remaining until the end of the year. The day of the week was Tuesday. A person born on this day will be 7 years old today. If that same person saved a Quarter every day starting at age 3, then by now that person has accumulated $425.75 today. A 5.8 earthquake occurred in Mineral, Virginia, the earthquake was felt as far north as Ontario and as far south as Atlanta, Georgia. Damaged occurred to monuments in Washington D.C. and the resulted damage was estimated at $100 Million. Libyan leader Muammar al-Gaddafi is overthrown after the National Transitional Council forces take control of Bab al-Azizia compound during the 2011 Libyan Civil War.